This anthology presents a series of texts in which major twentieth-century thinkers engage in dialogue with their predecessors. Presents a series of texts in which major twentieth-century thinkers engage in dialogue with their predecessors. 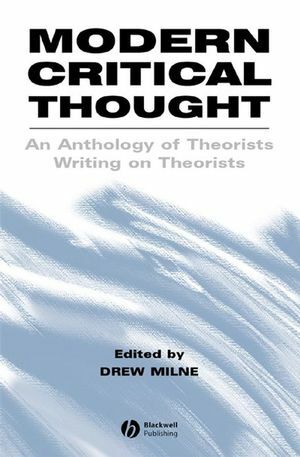 Offers an innovative way into understanding modern critical thought. Spans the period from Marx to the present day. A conversation of ideas emerges between one generation and the next. Editorial material defines key terms and maps out contested terrain. Each piece is prefaced by contextualising notes and suggestions for further reading. George Lukas, 'The Phenomenon of Reification'. Martin Heidegger, 'The Eternal Recurrence of the Same and the Will to Power'. Theodor Adorno, 'Sociology and Psychology'. Emmanuel Levinas, 'Reflections on Phenomenological "Technique"'. Hans-Georg Gadamer, "Heidegger's Later Philosophy'. 8. Deleuze on Nietzsche and Kant. Louis Althusser, 'Grom Capital to Marx's Philosophy'. Jacques Derrida, 'Structure, Sign and Play in the Discourse of the Human Sciences'. Michel Foucault, 'My Body, This Paper, This Five'. Jurgen Habermas, "Walter Benjamin: Consciousness-Raising or Rescuing Critique'. Jacqueline Rose, 'Feminine Sexuality: Jacques Lacan and the Ecole Freudienne'. Homi Bhabha, 'Interrogating Identity: Frantz Fanon and the Postcolonial Prerogative'. 15. Butler on Kristeva and Foucault. Slavoj Zizek, 'Holding the Place'.